Mr. Andy Hunt’s classroom is a trailer in the bus parking lot. You can hear rain pounding the roof of the trailer. Hunt is at his desk, amongst textbooks and papers, typing away at his computer. His classroom is scattered with cardboard boxes and stacks of paper everywhere. The desks are in twos, all facing a long white board covered in scribbles and delta-plus charts. He stops his work while I come and settle in for the long interview to come. It’s not that Mr. Hunt rambles, it’s just that he’s a knowledgeable teacher with a knack for lecturing and an incredible memory, especially for a history teacher. But he says he couldn’t hold a candle to his father. A high school history teacher as well, Hunt’s father had a great impact on Hunt’s decision to be a teacher. As a matter of fact, both of his parents did. His parents met at Appalachian State University, his father studying to be a history teacher, his mother studying to be a home economics teacher. His earliest memories come from his father teaching history at a small school called Princeton located in Johnston County. Although his mother stayed home when he was younger, when the family moved, both of his parents began teaching at his school. 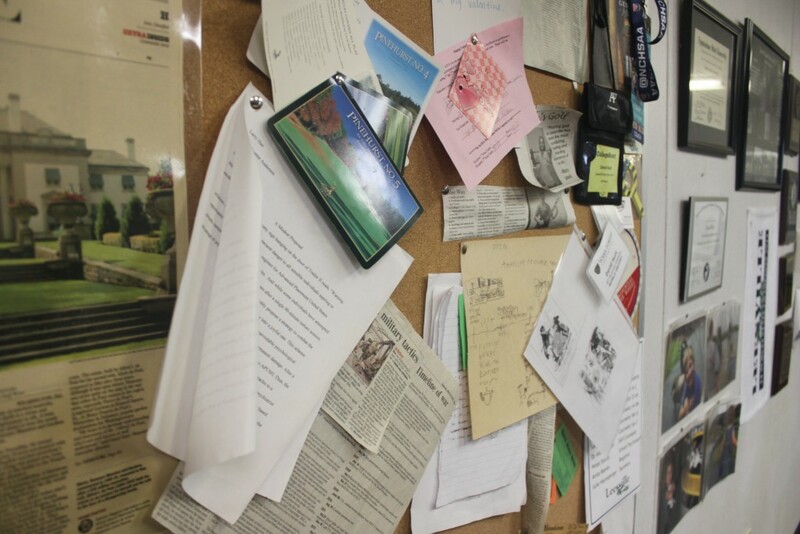 Hunt’s back wall consists of news paper clippings, student art, political cartoons, awards and degrees. “I’ve always lived in a school environment so this, to me, is home as much as anything else. This is where I grew up in, its safe for me, it’s comfortable, it’s something I understand, and it gives me an opportunity to continue to learn stuff and do what I enjoy doing,” said Hunt. Hunt went to Davie County High School with an estimated graduating class of 350. As a kid, Hunt was really involved in school athletics. He played football and golf, and his father almost always coached baseball as well as sometimes basketball and football. “If I didn’t have plans to be playing with friends in the neighborhood or whatever, I was at an athletic practice probably watching, helping, doing whatever,” said Hunt. If I didn’t have plans to be playing with friends in the neighborhood or whatever, I was at an athletic practice probably watching, helping, doing whatever. Today, Hunt is Leesville’s golf coach. His father’s interest and involvement in school athletics fundamentally influenced Hunt just as much as his father’s overall pursuit of education did. After graduating from Appalachian State University, Hunt began at Perquimans County High School, teaching six classes of Civics and Economics. 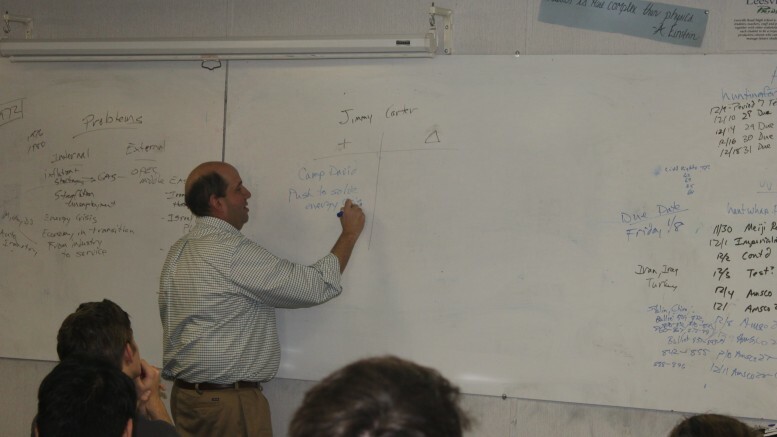 During his third year, Hunt started teaching World History and during his last two years, Hunt coached football and taught a weightlifting class in addition to C&E and World History. In the fall of 1997, Hunt began teaching at Leesville, although it wasn’t until 2008 that Hunt began teaching AP US History (APUSH). He admits that he had a lot to learn after taking on the class, having not taught American history since 1997. He attended a summer AP workshop at Wake Forest and still makes an effort to take advantage of the resources presented to him. 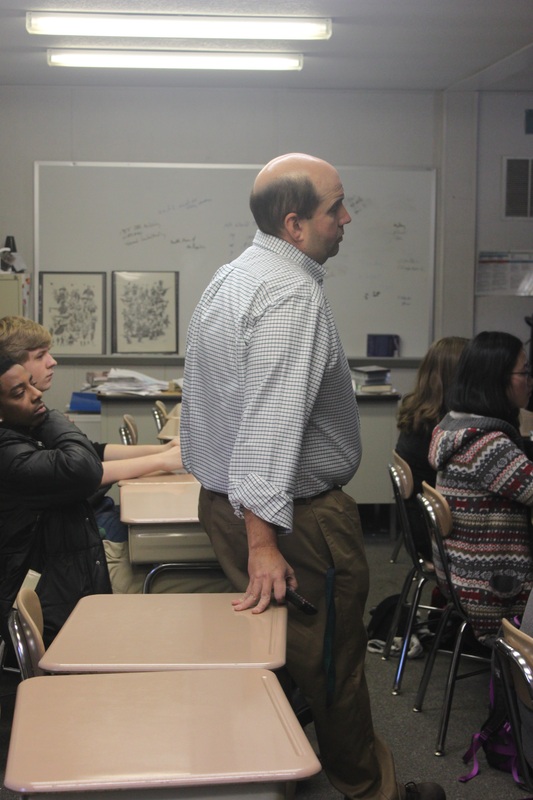 Students regard Hunt’s AP US History class as one of the most challenging classes at Leesville Road High School. Students come out of that class with one of two opinions: (1) you should never take the class or (2) you will learn more in that class than any other class at Leesville. And a significant number of students would actually agree to both. Hunt says that very few people have actually failed his class. Sure it’s challenging and a shock to the regular education patterns, but that’s really because students have never had a class like it. “It’s a different class from a lot of classes most students take[…] We’re gonna say, you leave middle school, if you’re a typical AP/Honours track kid, you leave middle school probably with straight A’s. You made like 132 in a class because there were massive amount of extra credit there was no chance that you would make anything close to a B. But that was because when you turned projects in, you used glittery letters, you used the appropriate sized poster board you made sure […] your letters were big enough, you wrote really neatly, you made sure you turned in all of your homework and when you studied for a test, you memorized the list of bullet points your teacher gave you so when you saw the questions that referred to the bullet points almost word for word, you got the answers correct,” said Hunt. Hunt goes on to say that there is a big transition between middle and high school when it comes to the course rigor. And he acknowledges that not all schools are the same, but that it’s this shocking change in class rigor that hurts students the most. “I feel like I did ‘here’s all this stuff, now rearrange it and prove a point.’ And that to me is a whole different level of knowledge[…]” said Hunt. His favourite analogy for the class is one that he stole from Mr. Phillips, a AP English teacher at Leesville, who compared AP classes to swimming. He says that you can read about swimming, take notes on swimming, watch movies about swimming, but sooner or later you’re going to have to get in the water. And it’s the sink or swim mentality of the the class that is the biggest challenge for students. The structure of the class depends heavily on self-involvement and reading the textbook. 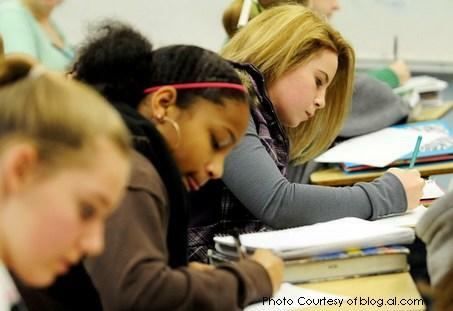 While there is rarely homework that is collected and/or graded, students have frequent open-note reading quizzes. That doesn’t sound too hard, but attempting to compress a full chapter of information onto a little half-sheet reading quiz means knowing what specific information you need to know is one of the greatest challenges of the class. Suddenly it’s not just a matter of reading the book and taking notes, but actually digging deeper into the reading, analyzing it, and discovering the key concepts– all in one night. And this is a big wake-up call for a lot of straight-A students who have managed to succeed just by fulfilling the requirements. “I thought that APUSH was an extremely difficult class that moved quickly, but in the end it prepared me really well for the AP exam, so I felt like it was worth it. APUSH can definitely be a big eye-opener for someone who is used to making straight A’s, however,” said Kelly Williamson, who took APUSH back in 2009. Williamson admits that the class was challenging and a bit of a wake-up call but that no other class prepared her so well for what was expected in college. “I definitely learned how to study from taking APUSH with Mr. Hunt. I had never really felt like I had to study prior to taking that class, so I struggled with the more difficult material once I got to APUSH and ended up meeting with Mr. Hunt a few times over the course of the semester to ask for study tips. His suggestions changed the way I study, and they were really useful to me once I got to college,” said Williamson. But aside from the learning and the intimidating reputation, there is something about Mr. Hunt that students who haven’t taken his class don’t realize; he’s really sarcastic. And his lectures were, for the most part, engaging and interesting. 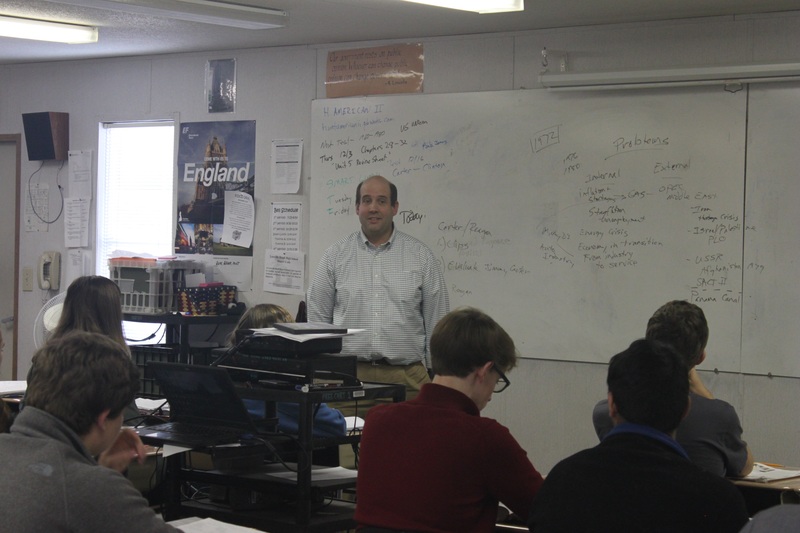 A standard lesson plan in Mr. Hunt’s class includes taking a brief reading quiz, going over the quiz or quizzes from the days before, and usually sitting down for a powerpoint of jumbled information where Hunt will spend ten minutes on one slide and two seconds on the next. The students are expected to only be adding to the notes they’ve already taken and continually decipher which information they need and which information they don’t. And then there’s asking questions. Hunt says that he wants to have a class conducive to discussion and participation. For students, it’s a little intimidating and frustrating when Hunt answers a question with a question or his infamous response of “yes and no,” but Hunt tells it as it is, and he’s not going to attempt to consolidate something that can’t be consolidated. “Mr. Hunt’s lectures were a great mixture of history and perspective, which really connected with younger intellectual minds. The sarcasm meter is always stuck on ‘max’, and that had a lot of appeal for people in Honors courses looking for something more than just facts to memorize. It worked on me, and I’d even say that it’s helped contribute to my cynical-but-humorous worldview today. I’d also call his methods effective for the simple reason that students were treated as adults, in both how the class was conducted and how discussions went — but it was earned,” said Eli Kratt, Appalachian State student, having taken three of Hunt’s classes over the course of his high school career. Venn diagrams, delta plus charts, timelines, any other kind of categorical construct that’s meant to consolidate information, if it exists, Hunt has probably used it. His long whiteboard is almost always covered in scribbles and descriptions that work to break down the information in a way that his students will understand. Hunt expects the students to come the class prepared to participate in discussion and pull knowledge from the book to add information to Hunt’s venn diagram– all to encourage higher level thinking for assessments later on. Tests in the class usually consist of a multiple choice section and an opened ended question usually in the form of an essay. The dreaded document based questions (DBQs) challenge the student to take texts (that they may or may not have seen before) and come up with a consolidated answer to the prompt that utilizes facts pulled from the documents given. All within a 45 minute period, and people wonder why the class is so challenging. 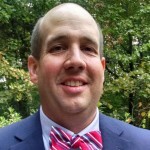 Mr. Andy Hunt teaches social studies at Leesville Road High School. Undoubtedly, students will be challenged by Hunt’s classes, but students who put the time and effort in will get a a lot out of the class. Hunt is well aware that he teaches complex concepts that involve a lot of thought and consideration. He expects his students to put the extra time in to make connections that they wouldn’t normally make otherwise. It may sound intimidating, but the first step is just to put yourself into the water and then decide whether you’re going to let yourself sink or you’re going to try and swim. “Mr. Philips said it the best when he said, you know it’s kinda like swimming. I can talk to you about swimming, I can show you videos about swimming but sooner or later, I’ve gotta throw you in the pool. And that’s kinda what happens,” said Hunt. 2 Comments on "Hunt knows school, does school, teaches school"
Mr. Hunt is a amazing teacher i would say my most memorable teacher from the class of 2000. His way of teaching really clicked with students from all walks of life. I think this was a great depiction of Mr. Hunt’s class. I took AP World myself. I especially liked how you got the opinions of previous students. What if Leesville had no AP Classes?